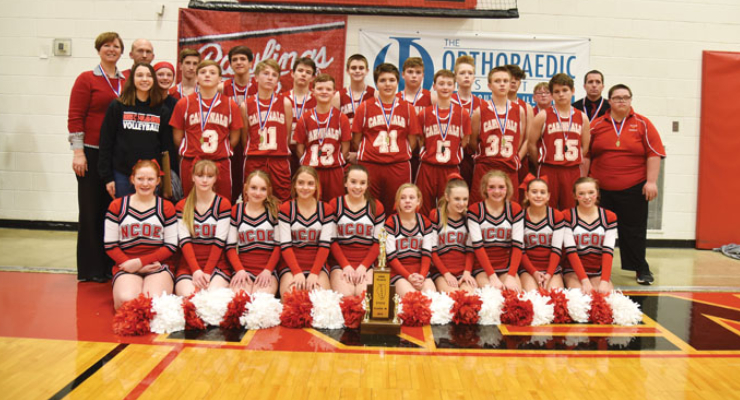 The Norris City-Omaha-Enfield Junior Cardinal basketball team headed back to Ina Friday night to take on the Pinckneyville Junior Panthers in the SIJHSAA Class M State Tournament Championship game at Rend Lake College. Riding a 26-game win streak into the contest, the Junior Cardinals looked like they were well on their way to extending this streak when Colby Prather knocked down the game’s first three points to give NCOE the early 3-0 advantage. The Junior Cardinals kept on rolling as they jumped out to the early 7-2 lead and with 3:35 left to go in the first quarter, one of the game’s officials suffered a leg injury. This injury would lead to an approximate 30-45 minute delay. When play resumed, the game would find the three man crew down to just two, as a referee from the previous game would fill in for the two referees that had to leave due to the injury. This stop in play allowed the momentum to shift drastically in favor of Pinckneyville as they went on a 10-3 run to close the first quarter of play with NCOE trailing by two points, 12-10. Second quarter action again found Pinckneyville using their size and strength to push the Junior Cardinals around which enabled them to outscore NCOE, to leave the Junior Cardinals on the short end of a 23-16 halftime score. Following intermission, the Junior Cardinals made some adjustments and hit the court with a new found level of intensity. They used this burst of energy to go on their own run, as they outscored the Panthers 14-8 in the third quarter of play to cut the Pinckneyville lead to just one point heading into the fourth and final quarter of play. This final stanza would witness Pinckneyville jumping out on top 35-30, forcing NCOE to call a timeout to regroup. After the timeout, the Junior Cardinals would get it back together and find themselves only trailing by two points, 38-36 with less than a minute of play remaining. As time was winding down, C. Prather would hit a three pointer from the corner with just :14 seconds remaining to give NCOE the 39-38 lead. Pinckneyville would then inbound the ball, go down the court, and fire an errant shot. Unfortunately for the Junior Cardinals, their defense was spread out, which allowed the Panthers to gather the rebound and the put back to take back the lead at 40-39 with just :03 remaining. NCOE would have one last shot, but a Junior Panther stepped in the way of a pass to put an end to the amazing Junior Cardinal season. This final :14 seconds witnessed NCOE experiencing the thrill of victory as well as the agony of defeat. In the end, it should be said that the Junior Cardinals did not lose this game; they just ran out of time, as the Junior Panthers were on the top end of the 40-39 score as the buzzer sounded. Preston Long led the scoring for the Junior Cardinals with 16 points. Joel Hortin followed with 13 points while Colby Prather added six points, Cord Tucker three points, and Erik Healy one point. Tucker and Long each dished out four assists to lead the way in the assist category. Erik Healy brought down a team high eight rebounds to lead the team while Joel Hortin added five, Preston Long five, and Cord Tucker two. Tucker topped all players with a team high four steals followed by Long with three and Hortin with two. NCOE finished the season with a 26-2 record along with a Gallatin County Tournament Championship, a Wayne City Holiday Tournament Championship, a Little Greater Egyptian Conference Tournament Championship, a SIJHSAA Class M Regional Tournament Championship, and a SIJHSAA Class M 2nd Place State Tournament Championship.